Charanga del Norte and Guillermo Davis: public talk, animation film screening accompanied by a semi-acoustic set from Charanga del Norte. Cuban dancer‐turned‐animator Guillermo Davis and Dr Sue Miller, musical director of Charanga del Norte and Reader in Music at Leeds Beckett University, discuss and present their collaborative projects in music, dance and animation film with screenings of animation shorts featuring music by Charanga del Norte (who will be performing a semi-acoustic set following the films). 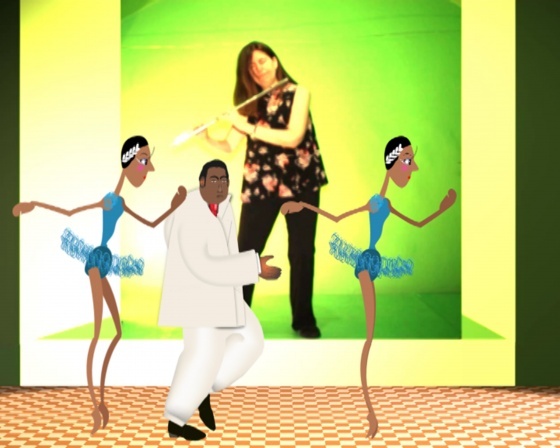 Films with music by Charanga del Norte include the animation ‘Charanga Time’ made to celebrate the band’s 20th anniversary in 2019; additionally Guillermo presents his animations ‘The Little Rose Shoes’ based on a Cuban poem for children by Jose Marti and ‘Grandad Go and Get the Bread!’, an animation short about an old man who shuffles out to dance on Carnival day. Another film short ‘When You Can Hear the River’ is an animation based on a devastating flood in Guillermo’s home town of Guantanamo. Come and listen and dance to the happy grooves of mambo, pachanga, chachacha and Latin soul with the best charanga band in the land! This entry was posted on Sunday, March 24th, 2019 at 8:00 pm	and is filed under Charanga del Norte, Gigs, home, Performances, press and publicity. You can follow any responses to this entry through the RSS 2.0 feed. Both comments and pings are currently closed.